The Senate Finance Committee has been plugging along since the 31st Alaska State Legislature convened in mid-January. We have held several informational hearings regarding the state’s fiscal standing. These meetings are very educational & instructive to members of the committee, other legislators, and to you – the folks at home. Please note this is not an extensive list of Senate Finance Committee hearings. We have held other meetings on legislation, confirmation of Governor’s appointees, and other topics not pertaining to the state’s fiscal situation or the budget. 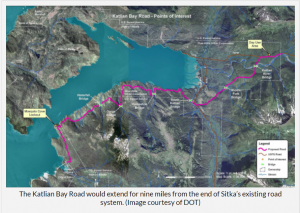 I am very pleased to announce the Department of Transportation & Public Facilities (DOT) has awarded a contract to build the Katlian Bay Road to K&E Alaska, Inc. The company is based in Sitka. My staff and I worked hard for many years to advance the project with DOT as a priority project that needed to keep moving forward. 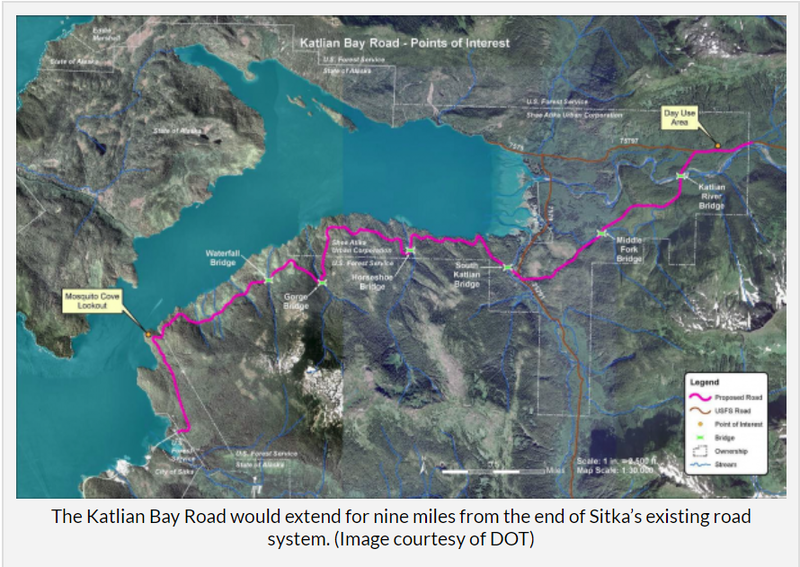 I want to thank Governor Michael Dunleavy and DOT Commissioner John MacKinnon for recognizing the value of the road to the community of Sitka, Shee Atika, and Sealaska, and moving quickly to get the project awarded. In addition to good paying construction jobs, the project provides access to Katlian Bay with opportunities for recreation, timber, subsistence, and remediation of the Katlian watershed and salmon runs. Access is provided to Shee Atika and Sealaska lands as well as state lands. The project would build about nine miles of new single-lane, unpaved road with bridge crossings, beginning at the northern end of Halibut Point Road, extending east along the south shoreline of Katlian Bay, crossing the Katlian River, and ending four miles east of the estuary. The road project was funded as part of a statewide bond package of transportation projects in 2012. The bond project was approved by voters statewide by a nearly 2 to 1 margin. It is great to see one of our projects in Southeast moving forward and onto construction. Editorial reprinted with Permission From Ketchikan Daily News. To navigate safely in difficult waters requires a seasoned mariner who fully understands the situation and draws upon a wealth of experience and skill to plot the best course ahead. By now, most Ketchikan residents know of the State of Alaska’s difficult situation and its potential impact on Ketchikan. Gov. Mike Dunleavy has proposed a budget that, in parts, would end the Alaska Marine Highway System on Oct. 1; remove about $7 million in funding for Ketchikan schools; take raw fish tax revenue away from our municipal government, and end state assistance on paying bond debt. Worse, Dunleavy and his administration have made it abundantly clear that the impacts of these changes are not their concern — it’s just a numbers game to them. Fortunately, there is separation of powers in Alaska’s government. It’s the state Legislature, not the governor, that holds the actual power of appropriations. Thus, Dunleavy has submitted his proposed budget to the Legislature for consideration. The Dunleavy budget has now landed in the Senate Finance Committee. This is where Ketchikan — and the rest of Alaska — can take heart. Why? Because at the helm of the Senate Finance Committee’s consideration of the state operating budget is the one legislator who, in our opinion, is the most qualified and capable of navigating Alaska through the Dunleavy budget storm. Sen. Bert Stedman, R-Sitka, is the right leader in the right position at the right time. Stedman understands many things — business; government and private sector finance; the workings of state government; and the people, place, cultures and economy of Southeast Alaska. Stedman has worked in commercial fishing, construction and as the longstanding owner of a Sitka-based investment services firm. He has served at the municipal government level with the Sitka City and Borough Assembly and the Sitka Planning Commission. He has served as Ketchikan’s state senator since 2003. He has extensive experience with the Senate Finance Committee, having previously served as its co-chairman from 2007 to 2012. He knows Dunleavy, who served in the Senate with Stedman from 2012 to 2018. Stedman also understands the oil industry, having served on The Energy Council and the National Petroleum Council. On resume alone, Stedman is the legislator most capable of steering the Senate Finance Committee and Legislature as a whole toward a rational budgetary solution. Beyond resume, the handling of the early Senate Finance Committee hearings by Stedman and Co-Chair Natasha von Imhof, R-Anchorage, indicate a firm grasp of the Legislature’s key role in the budget process. Stedman, in particular, has put the Dunleavy administration on notice that the Legislature will have its say. Most important for Ketchikan, Stedman understands how Dunleavy’s proposed budget would affect this community. Indeed they are. And it’s worth repeating the rest of Stedman’s comments here. Stedman said he believes that Dunleavy “has no interest in shutting down the economy of the state of Alaska. Stedman understands the situation. Better yet, he has the experience and skill to navigate the Legislature’s response in crafting a solution that won’t sink the economy of Ketchikan or any other Alaska community. Dunleavy can still play the spoiler later with line-item vetoes from the Legislature’s budget. But for now, and throughout the process, Stedman is the legislator needed at the helm. I was very pleased to hear from the Alaska Department of Transportation & Public Facilities and read in the media that work has finally begun on the First & Second Waterfall Creek bridges in Ketchikan. Constituents in this area of Ketchikan have been concerned about the inadequacy of these bridges for a decade. My office has been monitoring this project for years and when I toured these bridges a few years ago they were in bad shape. I saw that asphalt had worn out and the wooden substructure of the bridge was exposed – in fact, you could see through the bridge to the creek underneath. It’s long past time to replace these old bridges with more modern structures. This project is good for public safety and commerce. Driving conditions will be safer and fire trucks will no longer be limited. Also, land developers and builders’ dump trucks will no longer be weight restricted. In the 31st Alaska State Legislature, it is important to work on all the issues. While certainly not drawing as much attention as the operating budget, extending the Board of Marine Pilots is important to maritime safety and commerce. It is another step in protecting our waters for future generations. I am sponsoring a bill to extend the Board for eight years. The Board protects the safety of the public and the environment by licensing and regulating marine pilots for almost all foreign vessels and vessels over a certain size in Alaskan waters. Marine Pilots manage and supervise the navigation of cruise ships while they’re in state waters. The Board’s work provides a level of assurance that marine pilots are competent and able to safely pilot passenger and cargo ships throughout the waterways. I am glad to have a small role in making sure our waters and vessels are kept safe by the Board of Marine Pilots.